Victoria, Mahe (Seychelles) – July 11, 2017 (travelindex.com) – Last week’s editorial prompted much feedback from my loyal readers. One key point that was raised by many readers was the general and pervasive loss of respect for one another in the country. This was highlighted by stories of the deplorable and reprehensible behaviour of some troubled students in public schools; teachers are being subjected to degrading treatment by some youths they are striving to educate and in whom they are trying to instil a sense of morality. It is my view that this is an issue which our Nation must address as a matter of urgency. Teachers are an important and irreplaceable pillar in society, charged with grooming and educating our young Seychellois, and must feel secure in their workplace. Similarly, fellow students must feel safe in a learning and productive environment. Respect must start with families; bullying behaviour is learned behaviour and children will adopt the behaviours they are witnessing in the home. Respect must also be employed by those in Office; our Nation’s leaders must strive to be good role models to our susceptible youth because they dominate the media. The lack of respect across the board is threatening the basic fabric of good society. The notion of respect encapsulates a respect of the law and the institutions that comprise our country. Many years ago, in the early 1950s, the Executive, the Judiciary, and the Country’s influential landowners and taxpayers did not see eye to eye. The man of the era, namely Mr Charles Collet, the acting Attorney-General, was appointed to rewrite the Penal Code. He was unceremoniously disbarred and fled Seychelles for self-exile in France. He was in office but the institution was not being respected. However, this all occurred while we were still a British Colony. It is hoped that we as a Nation have progressed since then. Today we honour the same Mr Charles Collet, naming a building after him in the heart of Victoria, and history questions the happenings that unfolded not so long ago. Respect for the law and for one another is integral to a good and peaceful society. One notable family on Praslin have been trying to develop a small tourism establishment on their property for many years, but were thwarted at every turn by Government. Despite a recent Court order overriding Government’s decision to deprive the family of their right to develop their land as they had intended to, they are encountering further complications; there is a prospect of a new Government ring road from Anse Lazio to Mont Plaisir, which would effectively cut through the family’s property and disrupt once again the family’s dream project. Is this respect for the family’s rights, I wonder? Chalets d’Anse Forbans is a remarkable, small, family-run, Creole tourism establishment located on the south-east coast of the island of Mahé, the mainland of the Seychelles. It is located on the beach of Anse Forbans and boasts 14 self-catering beach chalets with a total of 16 rooms within a well landscaped tropical garden. This establishment celebrates its 23rd anniversary this year. The Chalets opened their doors to welcome guests on 20th October 1994 and have seen great success ever since, enjoying high occupancy levels. Chalets d’Anse Forbans are not only active in the tourism field; they are also known leaders in the fight for conservation in Seychelles. They actively support their local community and local businesses. They have partnered with others within their Community and now Anse Forbans enjoys their very own Community Driven NGO to support the environmental needs for this small village in the district of Takamaka. A commendable 90% of their employed staff are Seychellois. They have expanded over the years and recently underwent a major renovation, which has delighted faithful clients. Chalets d’Anse Forbans is very fortunate to enjoy a large clientele that return each year, some having returned annually to the charming establishment for a period of 20 years! They are pioneers in their field and have weathered global recessions throughout the past 21 years. Their business success is well demonstrated with their past rewards such as Tripadvisor’s Certificates of Excellence in 2012, 2013, 2014, 2015, 2016 and 2017, as well as their excellent scoring on Booking.com. Carmen Nibigira of the East Africa Tourism Platform was happy last week as she communicated to the world that Wakanow was now in East Africa. This was after Wakanow Ltd, Africa’s leading online travel agency, had formally announced its entry into the East African travel market, a move that will bring its innovative travel services to the regional traveler. The exclusive launch event which was attended by key regional travel trade stakeholders including airlines, hotels, travel agents and representatives of tourism bodies also witnessed the unveiling of the localized wakanow.co.ke travel portal. Speaking during the occasion, Mr. Obinna Ekezie, the Founder and Group Managing Director of Wakanow Ltd, stated that the East African market is and has always been a vital link in the African travel industry both as a vibrant inbound and outbound source of traffic. “The strong partnerships Wakanow has had with Kenya over the years and the growth we have witnessed from this region is an indication enough that a local presence in Kenya is vital at this moment to take care of the East Africa market”, said Mr. Ekezie. “I am particularly delighted at the prospect of bringing our travel expertise tailored for the African traveler to East Africa. From our humble beginnings in Nigeria eight years ago, we have become the best at what we do. Karibu and let’s grow the African travel industry together”, added Mr. Ekezie. While lauding the decision taken by Wakanow to open a regional office in Kenya, the Chief Executive Officer of Kenya Tourism Board, Dr. Betty Radier, underlined the need to grow tourism numbers into Africa and promote intra-Africa travel. “This is a commendable move by Wakanow. The Pay Kidogo Kidogo service will certainly be attractive for many in the region who want to plan their vacation over time”, commented Dr. Radier. As part of its services portfolio, Wakanow pioneered “Pay Small Small (PSS)” travel installment payment scheme which is a runaway success in its other markets. It is confirmed that JLL SSA has announced the promotion of Seychellois Mark Dunford to his new role as Head of JLL East Africa. Dunford is originally a Seychellois holding a Swiss/Kenyan nationality who relocated to the JLL Nairobi office in 2016 as part of JLL’s strategic expansion into the SSA region. Mark has more than 12 years of experience in real estate and hospitality advisory services internationally. In rounding up Dunford’s comprehensive background across various assets of the hospitality and real estate industries, his suitability for this new role is undeniable. His previous experience includes providing strategic advice on diverse hospitality and hotel development projects such as being accommodation advisor to the Rio 2016 summer Olympics, in addition to numerous projects in Africa and the Indian Ocean region. Most recently he has worked as a Senior Consultant at Lausanne Hospitality Consulting, Development Director at Singaporean private equity fund KOP Properties as well as having spent time as part of the Hotels and Hospitality Group in the London offices of JLL, when he initially joined the firm over 10 years ago. “I am excited by the opportunities which this new role presents as head of one of the fastest growing regions globally. Working with our expanding team of exceptional professionals based in East Africa, I look forward to helping our local and international clients achieve their ambitions” – Mark Dunford, Head, JLL East Africa. Although Dunford will continue to lead the Hotels & Hospitality division in east Africa for the remainder of this year, he will also take on the additional responsibilities of overseeing the region as their official head, focusing on strategic growth, business development, talent management and driving revenue growth. “Mark’s aptitude and contributions have been invaluable to JLL, he embodies so many of the wonderful traits of our company. I have no doubt that Mark’s vision will continue to enhance the strategic direction, growth, and profitability of JLL East Africa under his leadership” – Craig Hean, Managing Director, JLL Sub-Saharan Africa. As we say Congratulations to Mark Dunford from Seychelles, we also extend the same warm wishes to his mother, Mia Dunford. Mia is a firm believer in Sustainable Tourism Development and continues to be active in conservation and tourism related matters. She was formally part of the Senior Management at the Seychelles Tourism Board. Mark Dunford is a Tourism Ambassador for the Seychelles Tourism Board. African and Indian Ocean island hotels, resorts and DMC’s will be joining together to exhibit at the second annual Spotlight TravelExpo at Radisson Blu Hotel in Addis Ababa on 24th & 25th July. The event is organised by Derek Houston of Houston Travel Marketing Services. At this stage, 17 Exhibitors have confirmed participation including Seychelles Tourism Board and Thailand Tourism. Ethiopia is a fast-growing outbound market to the Rest of Africa & Indian Ocean islands. There is considerable corporate Business from Ethiopia into Nairobi, Kampala, Dar es Salaam and other African cities. Beach tourism is also a high priority for Ethiopians with the Seychelles, Kenyan coast and Zanzibar being popular destinations. Ethiopian Airlines is rapidly growing its route network to African/Indian ocean cities and Addis is among the most important African hub for European and global connections. Spotlight is once again partnering with Ethiopian Airlines, The Ethiopian Travel Agents Association and ETOA to organise this TravelExpo in Addis Ababa. Last year over 150 Travel trade attended. Ethiopian Airlines Addis based Sales team will be sending invites to all 95 IATA Travel agents as well as the 120 Non IATA Agents based in the capital. • A VIP Cocktail Party for 30 Top travel agency/Tour operator owners /directors in co-operation with ETAA, ETOA and Ethiopian Airlines on Monday evening 24 July. Sponsored by RadissonBlu Hotel. • A four-hour morning TravelExpo session on Tuesday 25 July 2017 at RadissonBlu Hotel. As the World is taking stock of the effects of Climate Change, James MacGregor, the President of ecoplanet forwarded this article by Dan Shepard from Africa Renewal. Researchers are still trying to learn why the population of African penguins has dropped precipitously over the last 15 years — some estimates say by 90% — but most agree that climate change is a major factor in the decline of this iconic African species. There may be additional forces at work, including pollution, overfishing, predators and disease, but warming currents on both sides of the continent are driving the huge shoals of sardines and anchovies on which the penguins dine farther south toward cooler waters. Warming waters are not a problem only for penguins and other sea creatures. They have major implications for coastal communities all around the continent, where a quarter of all people rely on the ocean as a primary source of food. Globally, average temperatures will increase by more than 2°C by the end of the 21st century, and could increase by as much as 3°C by 2050 and even by 6°C by 2100. The impacts of this warming on the ocean surrounding the continent are already being felt. Small-scale artisanal fishing and tourism are critical economic pillars for communities along Africa’s 30,500km coastline. Many of these are grappling with the effects of climate change, including rising sea levels, warming waters and increasing ocean acidification, which has led to greater coastal erosion that has damaged infrastructure in West Africa. A warming Indian Ocean has damaged coral reefs that are essential for tourism, fishing, and the protection of the shoreline. According to Beejadhur, natural resources specialist, sea temperatures in coastal boundary systems may continue to increase over the next few decades and centuries. If current trends continue, sea temperatures will increase from 0.62°C to 0.85°C over the next few years and from 2.44°C to 3.32°C over the long term, he warns. “This will mean Africa will need a cascade in financing. It will require significant funds, finance and investments that need to be unlocked, leveraged and catalysed for building resilient and climate-smart ocean economies,” he predicts. Jacqueline Alder, manager of Global Partnerships for Responsible Fisheries at the Food and Agriculture Organization (FAO), also notes the significant impact on coastal infrastructure of coastal erosion. Fishery landing sites have been forced to move, resulting in higher fishing costs. In some cases, poorer quality fish has led to lower market prices. In addition, more frequent flooding has affected coastal systems, with runoff from the storms ending up in the oceans, reducing the salinity of the water and causing fish to move farther offshore. Consequently, fishermen have to travel farther to catch fish, “or they don’t fish at all”, she says. Coastal erosion has led to the displacement of communities in West Africa and has already resulted in economic losses of about 2.3% of GDP in Togo alone, the World Bank reported in 2016. African countries often lack the data, the computing power and the analytical ability to take action, Jumeau points out. Another result of climate change is ocean acidification. As the ocean absorbs greater amounts of carbon dioxide, it becomes more acid, and its changing chemistry poses a threat to coral reefs and biodiversity. About 30% of carbon dioxide caused by human activity dissolves into the oceans, and the increased acidity prevents organisms that depend on calcium carbonate from producing shells and skeletons. Fisheries in the western Indian Ocean — off the east coast of Africa — mainly depend on coral reefs, Jumeau points out. Increased coral bleaching and mortality (generally caused by warming ocean temperatures) will have negative effects on fisheries, fishery-related employment and nutrition. Corals across the western Indian Ocean declined by an average of more than 35% after bleaching events in 1998, 2010 and 2016. Such events have an economic cost: the coral bleaching event in 1998 cost the scuba dive tourism industry an estimated $2.2m in Zanzibar and up to $15.09m in Mombasa, Kenya. Coral reefs in the Seychelles also suffered from the 1998 bleaching event, which was caused by warming from an El Niño weather phenomenon, but other bleaching events have also affected the country, recalls Jumeau. Some reefs have since been restored to health; others have not. Coral reefs are an essential tourist attraction and provide protection from coastal erosion for the hotels on the islands. Around 2.5-million tourists per year visit the tropical coast area of Egypt; 23% of these tourists come specifically to dive, and a further 33% participate in snorkelling activities. Cognisant of the destructive impact of climate change on the oceans around Africa, affected countries came together at the African Ministerial Conference on Ocean Economies and Climate Change in Mauritius in September last year to assess the challenges faced by coastal and marine systems in Africa and discuss the need to develop climate-ready ocean economies. And last November, at the 2016 Marrakech Climate Conference held in Egypt, the World Bank, the Asian Development Bank and the FAO announced an African package for climate-resilient ocean economies, an ambitious bundle of technical and financial assistance focused on measures to build resilience, reduce vulnerability, develop early warning systems and optimise carbon sequestration. Between 2017 and 2020, the initiative will mobilise between $500m and $900m and implement programs linked to climate change adaptation and mitigation. World Bank experts caution that without action, fish catches are projected to drop because of climate change — possibly by one half in Côte d’Ivoire, Ghana, Liberia, Nigeria, Sierra Leone and Togo, according to the FAO. “These ambitious programmes aimed at strengthening the resilience of African coastal communities are critical to meeting the challenges and opportunities of climate change, especially for vulnerable Small Island Development States,” observes Maria Helena Semedo, FAO’s deputy director-general for natural resources. The African package for climate-resilient ocean economies is composed of five flagship programmes, and each will have its own focus as well as sharing knowledge and best practices with the others. In North Africa, the focus will start with fisheries, aquaculture and ocean observation systems; West African priorities will include fisheries, combating coastal erosion, and building tourism; in Central Africa, stretching from Cameroon to Angola, priorities will include a focus on safety at sea; East Africa will develop its aquaculture and tourism; and the Small Island Developing States, often the most dependent on the oceans and the most vulnerable to disaster and erosion, will focus on the development of an economy designed for sustainable development, generally referred to by experts as the “blue economy”. African countries will be participating in the Ocean Conference to be held this year in New York from 5-9 June, which is aimed at promoting the implementation of Sustainable Development Goal 14 (life below water). The goal calls for action to address a range of ocean issues, including protecting marine biodiversity, reducing overfishing and addressing ocean acidification and marine pollution. The Sahel has been battered by drought due to climate change. Editor’s Note – Seychelles also suffers from effects of Climate Change as it promotes and is recognised for its work in the field of the Blue Economy. The personal efforts by former President James Michel earned him special recognition at a recent United Nations meeting. 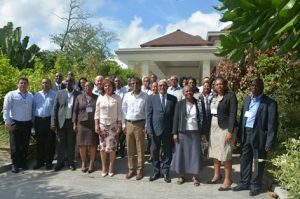 An important meeting of Port Management from Eastern and Southern Africa was held in Seychelles by the PMAESA, the Association looking at the management and also at the growing of Port activities. Mrs Nozipho Mdawe, the Secretary general of the Organisation worked in close collaboration with Col. Andre Ciseau, the CEO of the Seychelles Ports Authority and the meeting was a great success for greater Africa. Land-locked countries as well as coastal regions joined hands together to work with the Indian Ocean Vanilla islands grouping to further consolidate ‘Cruise Africa’ in all its diversity. To make cruise shipping work we need ports, we need air access and this consolidates tourism. ‘Brand Africa’ comes in and the narrative about Africa is to be seen by Africa for Africa. Ports and everything to do with shipping opens up the Blue Economy and this can overflow in what is today seen and promoted as sustainable tourism development. Saint Ange Consultanty was contracted to be the meeting’s moderator and Alain St.Ange was personally in hand. Pascal Viroleau, the CEO of the Indian Ocean Vanilla Islands was invited by PMAESA (Port Management Association of Eastern & Southern Africa) to present the Indian Ocean Island’s drive in cruise tourism and the successes achieved. The well-prepared presentation by Mr Viroleau showed the steps taken by the Indian Ocean Islands to grow cruise tourism in the Indian Ocean. His focus is to ensure that new cruise ship lines programmed for the Indian Ocean extend their season in the region and also to stay longer in the ports to allow more time for passengers to really appreciate the islands. Pascal Viroleau also discussed the support being given to cruise shop companies that have become partners of the Indian Ocean Vanilla islands. The Comoros are today holding the Presidency of the Vanilla Islands. They took over from Mauritius last year after a very successful mandate held by the then Deputy Prime Minister Xavier-Luc Duval who was also Tourism Minister. Emilie Lauret, the Communication and Events Coordinator of the Export Department from Reunion Region, was also present at the meeting. Le Paradise Cove Boutique Hotel is for Mauritius a success story of the island’s tourism industry. This is what Jean-Michel Pitot, the CEO of the Attitude Group, said at an event marking the 25th Anniversary of the Paradise Cove Boutique Hotel at Anse La Raie in the north of the island of Mauritius. In his address, Jen-Michel Pitot said 5 years have already elapsed since Attitude Group took over the management of Paradise Cove. “We had already brought in special Attitude touches and our style of doing things. Our marketing and sales staff backed by our operations department moved fast to create the first Adult Only Boutique Hotel and the only one for Mauritius” Mr Pitot said before adding that they moved with the “You & Me” Signature approach and delivered to the expectations of their clientele. “Paradise Cove Boutique Hotel is the fruit of Jean Marc Harel from the 90s. He was innovative and wanted to create something special. Today I want to pay homage to this great man who was brave but with a vision” Jean-Michel Pitot said. The Paradise Cove Boutique hotel has 67 rooms, employs 164 Mauritians and has become a reference name for Mauritius in the category of Best Boutique Hotels. The property is today listed as a Small Luxury Hotels of the World.